The truth is, there are countless things that should be on your "to-do" list when starting your own business. But we lay out the details of a few so you're off to a good start. You’re tired of working for someone else, of feeling overworked and unappreciated. So, you've decided to take the leap and begin your own business venture, but you just aren’t sure where to begin. Use these helpful hints to get started on the right foot. 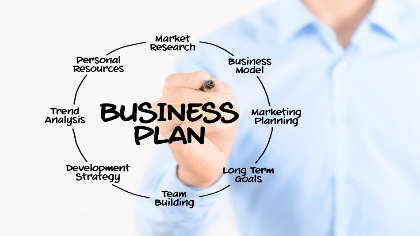 Prepare a solid business plan. Too many times this important step gets overlooked. Before you tell your boss to take this job and, well, you know…be sure you've worked out all the kinks and have done your research. You don’t want to burn bridges with your current employer only to realize no one is interested in your cute, adorably stitched baby booties. Take time to find out your competitors and determine what will make your company different. Determine how you will finance your business. The way you finance your company is one of the most important decisions you will make. Will you use your savings account? Will you seek out investors? Will you obtain a bank loan? If you do take out a business loan, borrow responsibly. Even if you are overjoyed and confident about the potential of the new biz, you have to prepare yourself for the fact that the business might fail. Borrow responsibly. Do not go cheap on this one. Find a good accountant who can handle your taxes. The last thing you want is the IRS coming after you because you simply forgot to file an extension or neglected to pay your payroll taxes on time. Be aware that a bookkeeper is not the same thing as an accountant. They perform completely different functions. Most of the time bookkeepers work with CPAs, and most likely can give you great recommendations. You will need to make the decision of which type of business ownership is best for you. There are several to choose from: sole proprietorship, partnership, LLC (Limited Liability Company), corporation, S corp, nonprofit or cooperative. Be sure to research this information and speak with your CPA before making any final decisions. Register your DBA (Doing Business As). If you decide to do business as anything other than your name, you will need to register your company name with your state. You can do this at the county clerks office or online from a DBA filing service. Obtain an EIN (Employer Identification Number), which will be used for filing taxes. This is how your business will be identified. If you are using your actual name for the business, you will not need to obtain a DBA or EIN. Your social security number will be used in the place of an EIN. Get a company bank account. Do not mix your personal funds and expenses with your business ones. The best way to prevent any mishaps is to open a business bank account. Only use your business account for business transactions. It will make things easier for your business, and your CPA will thank you.